Today it is May 4th. For the Dutch it is a very important day. Because today it is Remembrance Day. The day all people take two minutes two remember all the fallen since World War II in silence. Every May 4th at 8 pm sharp there will be beautiful ceremonies all over the country. The one Amsterdam is shown on tv and counts as the National ceremony. Our King and Queen will attend this ceremony, together with war veterans from World War II and people of the resistance. But also veterans from other wars and missions will be there. And the fallen will be remembered. After the two minutes of remembering in silence the national anthem – Het Wilhelmus – will be played on a trumpet. Me sure is glad me is wearing a sweater today. Because it gives me goose bumps every time. Me think it is very important to remember the fallen that have fought for the Dutch freedom. Me think it also very important to remember that being free is not obvious and should not be taken for granted. Is also very important to keep respecting everybody’s differences. So me will be silent and not eat a cookie at 8 pm tonight for two whole minutes. Just to show respect for everybody who fights for freedom and does not take it for granted. O and May 5th there will be a nationwide party. 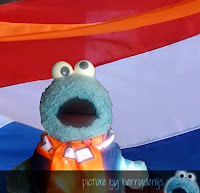 Because then the Dutch celebrate Liberation Day. The day the country officially was freed from the occupation. So… the flag will be at the top of the flagpole and me will go out and party. Or just stay at home with some delicious cookies.